The Landmark book that started it all. When couples start thinking ahead about their 'transition into parenthood', they picture the family of their dreams. But 'transition' doesn't describe the reality for most new parents. 'Adventure' is more like it. And, like any adventure, there's bound to be some rivers to cross and mountains to climb. If you're a new parent, you'll be discovering this for yourself. Your baby is beyond adorable, but some of the learning curves are probably steeper than you'd expected. Breastfeeding doesn't necessarily come naturally at first. Settling your baby can leave you with frayed nerves. Negotiating visits from your in-laws can cause conflict and your partner just doesn't understand. Some days you're getting ahead and others you're feeling snowed under. You may wonder what's happening and why it's happening to you, when everyone on Instagram seems to be doing just fine. If this sounds like you, don't worry, you're not alone! And forget Instagram. Most new parents struggle at some stage. Chances are you just weren't prepared for it all. You had regular check-ups during pregnancy, a team for your birth and then nothing. You and your partner have to figure out all the 'after you get the baby home stuff' on your own. But what if you could both plan now for the next river or mountain or snow day? What if you could have foresight for the normal and common parenthood challenges that life's likely to throw at you over the next few years? What if, no matter where you were now in your parenthood adventure, there was a way, not only to cope with the challenges, but to pull closer as a couple through them and become the best parenting team possible for your baby at the same time? There is a way. You can still have the family of your dreams, it's never too late. And you don't have to figure it all out on your own - but it's likely you'll need to do some homework to get you to the next stage. 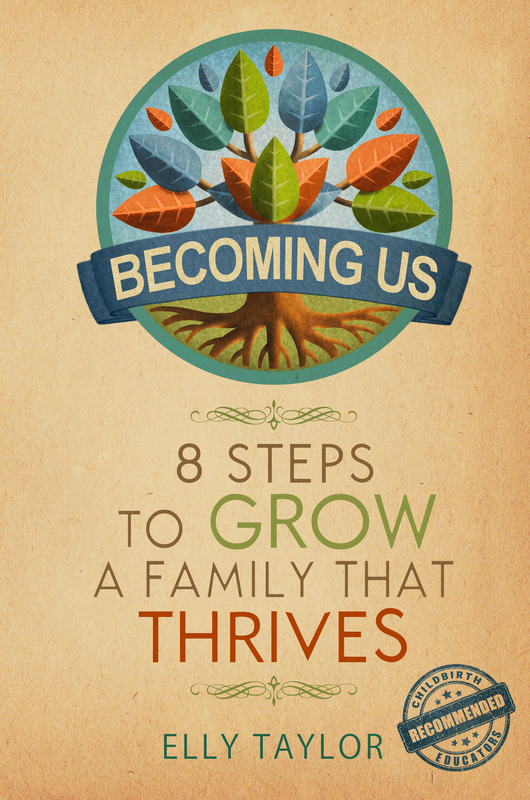 Based on 15 years of research, Becoming Us describes the normal stages that couples go through in their first few years of family, and the steps to navigate each of them. People say nothing can prepare parents for parenthood, but Becoming Us gives you the knowledge, practical skills and guidance to love, learn and grow - step by step - into a family that thrives. Maybe just in time for your next baby. "This warm, inviting and supportive book is a superb gift to the expecting couple." Suzanne Arms, Birthing the Future. "A Landmark." - Dr Jordan Paul, Do I Have to Give up Me to be Loved by You? "Wonderful, worthy and needed." - Dr Marcy Axness, Parenting for Peace. "A book for real parents. The world needs this! ", Kent Hoffman, Circle of Security.